This section provides a quick description of the processes tab that lists all running processes on the system with CPU and memory usage information. Comparing to the Applications tab, the Processes tab is much more interesting. The Processes tab shows information about the processes running on your computer. Processes listed on this tab represent applications that you started yourself interactively, applications that other users started through remote connections, applications that started by the system as start up programs, and background processes started by the system as system services. As you can see from this picture, you can select any process and click the "End Process" button to close the selected process. 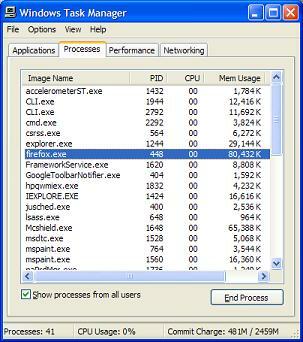 Windows Task Manager provides very similar functions as the "ps" command on a Unix system.